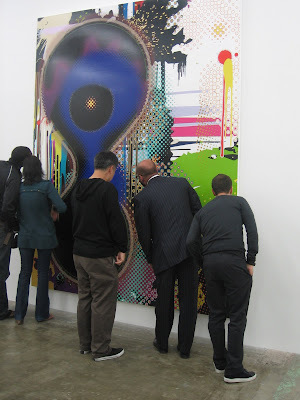 Murakami, the subject of much news here in New York at the moment, returns to Los Angeles for the first time since his influential show at the Museum of Contemporary Art (MOCA). From May 3 to June 14, Blum & Poe will present Takashi Murakami’s “Davy Jones’s Tear.” This is a rare solo show of his new works. The “Superflat” artist’s works are abstract and span from all different color ranges to splashes and blotches, to pixelated images, a contrast from his previous work. Murakami is known in part for his collaborations with Louis Vuitton and Kayne West, as well as his “Superflat” movement. The opening ceremony on May 3rd, featured a dinner hosted by Blum & Poe, following a short speech by Tim Blum. Fellow artist Mark Ryden also made an appearance. MAKE sure you have enough vitamin E in your diet. You could take a supplement or find it in foods such as vegetable oils, seeds, nuts and wheat germ. CUT down on coffee. It is believed that caffeine may be one trigger that causes restless legs. MASSAGE your legs, which will help keep the circulation working properly. This entry was posted on Friday, May 16th, 2008 at 3:31 pm	and is filed under Art News. You can follow any responses to this entry through the RSS 2.0 feed. You can leave a response, or trackback from your own site.